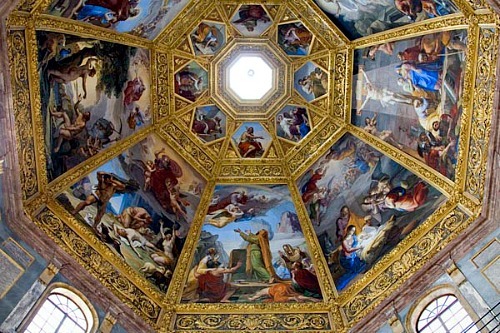 The Medici Chapel (Cappelle Medicee) is paradise for Michelangelo fans. Not only can you see one of the only architectural designs brought to completion by the master (ie the New Sacristy) but the museum houses no fewer than 7 sculptures by the Renaissance genius. And that's just one part of the museum! 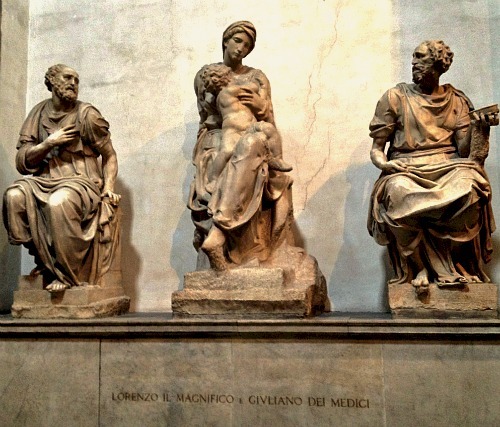 Read below to find out all you need to know about the Cappelle Medicee including opening hours, ticket information, and the history and significance of the artwork it contains. At the bottom of the page see also a short video, link to map of location and information about the absolute best way to book tickets! 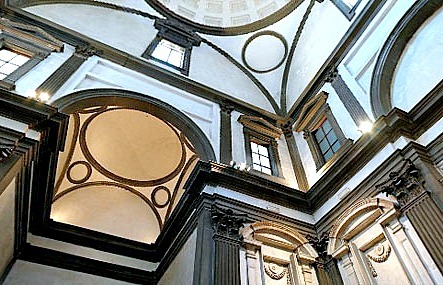 La Sagrestia Nuova is the most heralded part of the Medici Chapel Museum. Basically, the New Sacristy is a Michelangelo feast with architecture, design and sculpture by the Renaissance master. 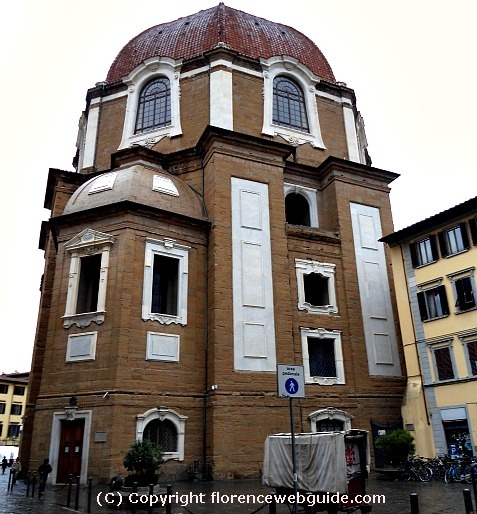 The small-domed building (construction date 1521 - 1524) was built upon request of Cardinal Giulio de Medici, who later became Pope Clement VII (Giulio was the illegitimate nephew of Lorenzo the Magnificent). The Pope at that time, Leo X - Lorenzo the Magnificent's son - also wanted the New Sacristy built as the building was to serve as a mausoleum for the Medici family. This is one of the only completed constructions where you can see the work of Michelangelo as an architect rather than a painter or sculptor. The architecture was inspired by the design of the Pantheon in Rome (126 AD). 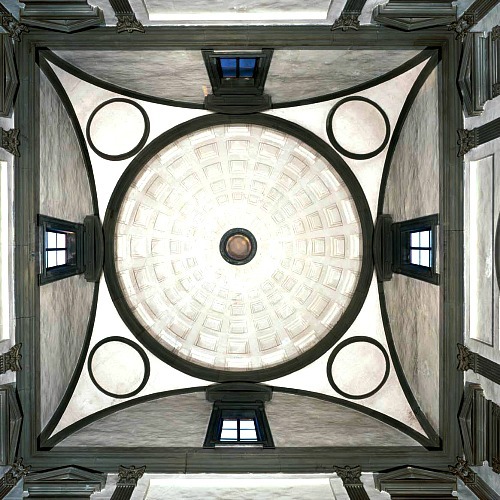 The domed ceiling of the New Sacristy is a replica on a much smaller scale of the Pantheon dome whose beauty, elegance and harmony was greatly admired by Michelangelo. Michelangelo's building is much smaller than the Roman temple though, so he used some 'tricks' of design to fool the eye. Michelangelo made the window frames higher than what the proportions would have required, so that from the ground looking up the space appears higher and the room has an airy feel in spite of its smallness. After completing this building, which is basically a small annex to the San Lorenzo basilica, Michelangelo then worked on the sculptures and sarcophagi that would serve as funerary monuments to the Medici. The maestro carried out this project up to 1533, after which he left Florence for Rome and never came back, leaving the work nearly fnished but not entirely. Ironically, the magnificent tombs seen today were built for two lesser known members of the Medici family, Lorenzo II and Giuliano, un-heralded dukes. The burial place for Lorenzo the Magnificent, considered the Lord of Florence, and his assassinated brother Giuliano (murdered by the Pazzi family – Medici rivals - in the Duomo), were never even started by Michelangelo. 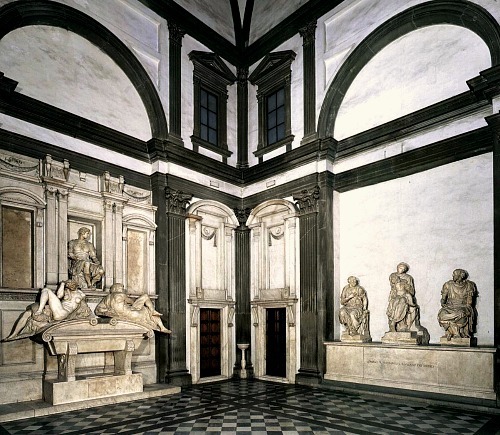 These two major Florentine figures are modestly buried in a simple stone coffin just to the right as you enter the New Sacristy, whereas the elaborate tombs on the right and left are for their much less famous relatives. The monument to your left when you walk in is for Lorenzo II de Medici, Duke of Urbino. Lorenzo II lived a short life (1492 – 1519) and ruled Florence for a brief period (1514 – 1519). This Medici - grandson of Lorenzo the Magnificent - was a relatively 'minor' member of the family whose main claim to fame is that he was the father of Catherine de Medici, future queen of France. Below, lying on the sarcophagus are the two sculptures 'Dawn and Dusk'. 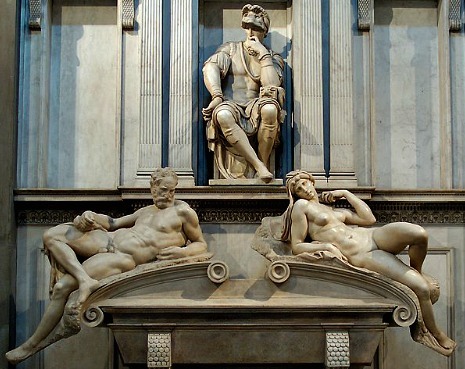 The second funerary monument is to Giuliano de Medici, Duke of Nemours (1478 – 1516) who was the youngest son of Lorenzo the Magnificent and brother of Giovanni de Medici, Pope Leo X. 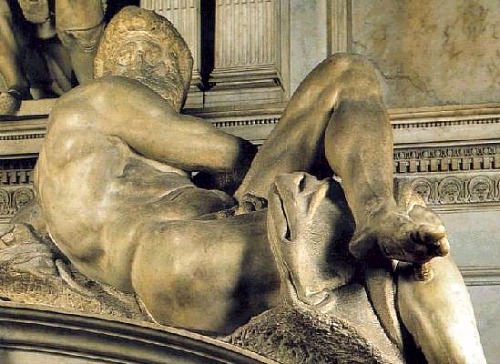 Below lying on the sarcophagus are Michelangelo's 'Night and Day'. In both the tributes to Lorenzo II and Giuliano Michelangelo the men are depicted as Roman soldiers. Lorenzo is envisoned as a reflective man, with a dark countenance whose helmet and hand keep light off his face, whereas Giuliano is seen as a man of action, holding a military weapon. These statues representing Giuliano (lower left) and Lorenzo II (lower right) were not realistic representations of the actual men, but were meant as allegorical figures. Michelangelo felt that 'in hundreds of years in the future, nobody would care what the actual men looked like' so the maestro created 'universal images' representing the two sides of man: thought and action. 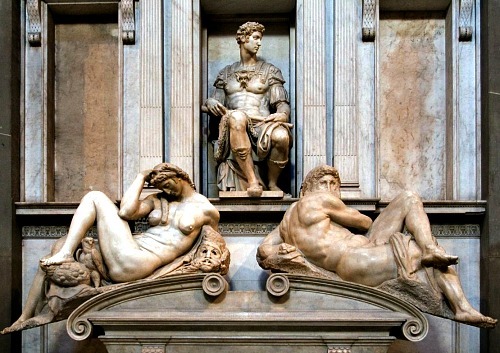 People often ask about the meaning or symbolism behind Michelangelo’s sculputures for these funerary monuments, the most famous part of the Medici Chapel. It is thought that the four parts of day were meant as an allegory for the phases of life: 'dawn' for the time of youth, 'dusk' as we approach old age, 'day' for our time on earth and 'night' for death. 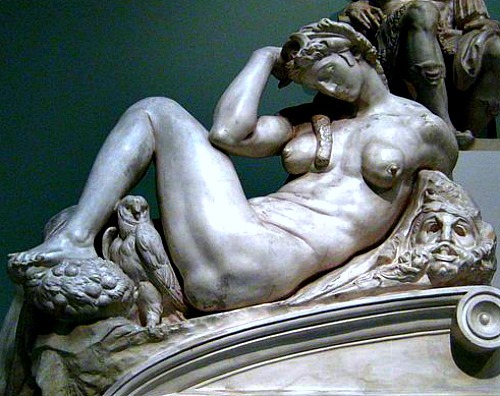 People also wonder about the gender of Michelangelo's sculptures. Meaning, why is 'Dawn' a woman and 'Day' a man, and not vice-versa? 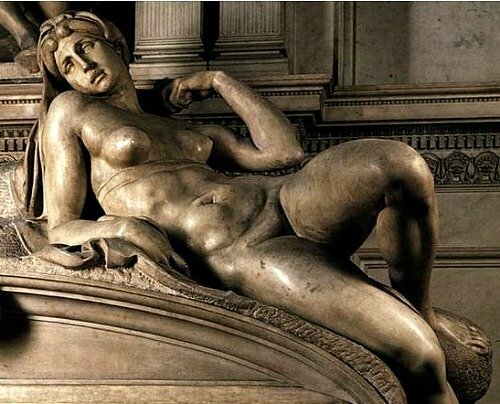 Rather than any particular symbolic significance, the gender of the sculptures was decided by something as simple as Italian grammar: the word for 'dawn' is 'alba', which is a feminine noun in Italian, and thus, this statue was made in the likeness of a woman. 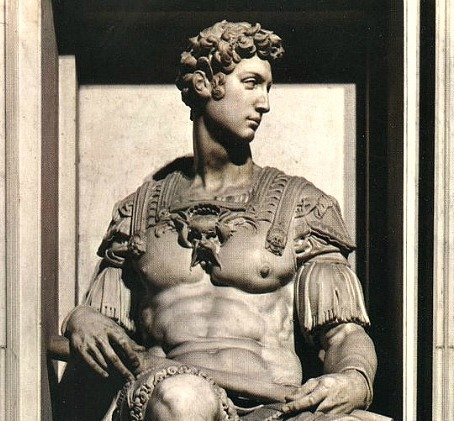 Similarly, 'giorno', the word for 'day' is a masculine noun, and voilà, this statue is a male. The same for 'night' and 'dusk'! See a close-up of 'Night' below. The much more spartan and incomplete burial place (notice the bare back wall) in the New Sacristy is where Lorenzo the Magnificent and his brother Giuliano are buried. Here too you can see a Michelangelo, the graceful 'Madonna and Child'. The two sculptures that flank the 'Madonna and Child' represent the saints Cosmas and Damian, who were considered protectors of the Medici family. These were sculpted by pupils of Michelangelo. Somehow, the fact that Lorenzo il Magnifico, Florence's greatest patron of the arts during the Renaissance, has a quite plain unadorned tomb buried together with his brother is fitting. 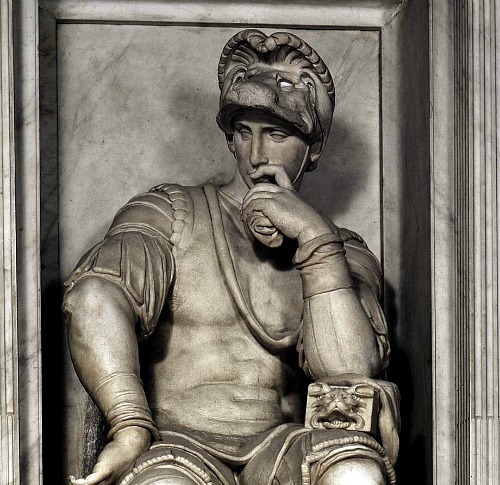 Lorenzo was a part of the earliest faction of the great family, who believed that wealth should not be flaunted unnecessarily (more on this later when we talk about the Chapel of the Princes!). He was also profoundly devoted to his brother who died during an assassination attempt on both their lives, which Lorenzo barely managed to escape alive from. The Medici Chapel, for a brief period in about 1530, was also a hide-out for Michelangelo who had fallen out of favor with the Medici rulers. There was a political struggle taking place with the people wanting to oust the Medici who were in charge at the time and go back to a more democratic Florentine republic. 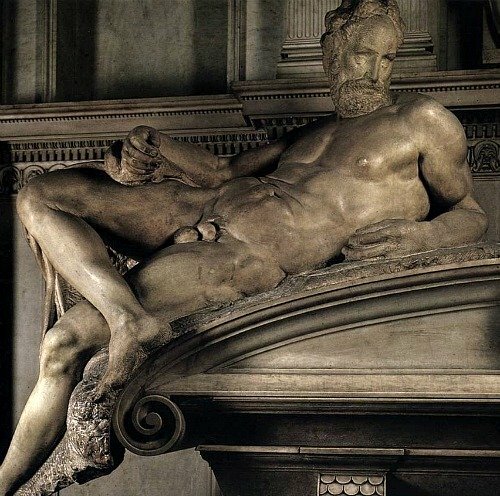 Michelangelo, in spite of the fact that as a youth he had been taken in by the Medici's who helped him train as an artist, and despite the fact that the family were his main benefactors, sided with the rebellious citizens. As a result, the maestro was put on the Medici's 'black list', and had to hide out in an underground room in the Medici Chapel where he took to doodling on the walls. His sketches were found in 1976. Today this room is rarely opened in order to protect the drawings from deterioration. 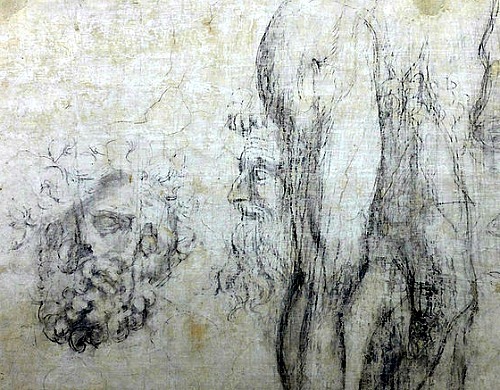 However, behind the altar you can see other drawings and sketches on the walls - these too supposedly by Michelangelo - which look like renaissance doodling or graffiti. 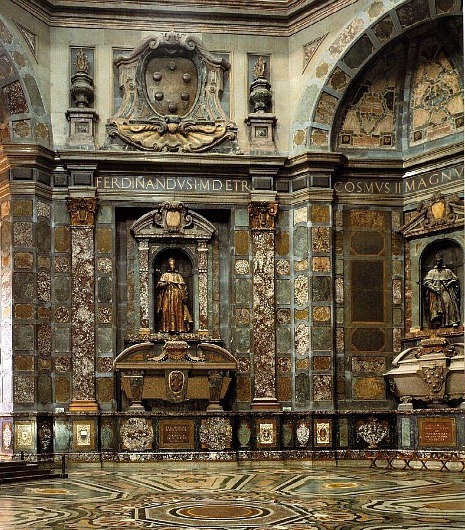 The second main part of the Medici Chapel is called the 'Chapel of the Princes' (cappella dei principi). This chapel is very large and high-domed and can be seen as either extremely sumptuous or extremely gaudy! One important thing to know about the Chapel of the Princes: the Medici that the chapel was built for belonged to the secondary line of the family, starting with Cosimo I, the first Grand Duke of Tuscany (as of 1569). This 'offshoot' branch of the family were much less modest than the original Medici of the 1300 and 1400's. Starting with Cosimo I, the family broke away from the old Medici custom of not showing one's wealth and instead became ostentatious and eager to flaunt their power. This explains in part the lavishness (overdoneness?) of the Chapel of the Princes. BTW, in spite of the name, no Medici held the title of prince, but were only dukes! This part of the Medici Chapel dates from the 17th century (construction date: 1604-1640). Commissioned by Grand Duke Ferdinando I, the chapel was built according to designs by Don Giovanni de Medici who was the illegitimate son of Cosimo I. The decoration of the lush interior was not finished however until the late 1800’s. This opulent display was meant to be the final resting place of the Medici's in power from the 1500's onwards: Cosimo I, Cosimo II, Cosimo III, Ferdinand I, Francis I and Ferdinand II. 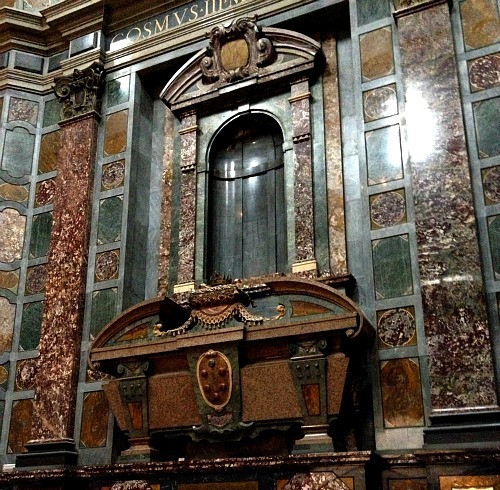 In actuality, the enormous sarcophagi are empty and serve only as funeral monuments (called cenotaphs), as most of the Medici were actually buried in the Medici Chapel crypt (see below). Behind each sarcophagus is a niche in the wall, meant to hold a bronze statue of the Medici who was supposed to be buried there. Only two of these sculptures were effectively carried out however: statues of Ferdinando I and Cosimo II done by Pietro Tacca. Florence's Opificio di Pietre Dure (the Workshop of Semi-Precious Stones) was set up for the purpose of executing this part of the Medici Chapel decorated with Florentine mosaic works. In fact, this is the most extravagant use of Florentine mosaics that you can find. 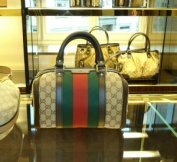 The meticulous piecing together of all the different stone pieces forming a smooth uniform image took nearly 200 years. Two details to notice when you are in this part of the Medici Chapel are the coats of arms along the walls of the many Tuscan cities that had been under Medici rule, and the grand Medici coat of arms on the ceiling. 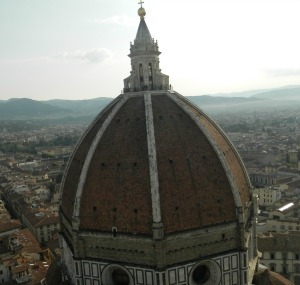 The frescoed dome – which echoes Brunelleschi’s cupola in the skyline – is decorated with scenes from the Old and New Testament. The frescoes were commissioned in the 19th century by the Lorraine's who were in power at the time, as the Medici reign ended in the mid-18th century. The entrance to the Medici Chapel takes you directly into the crypt, and it is from here that you go on to the Chapel of the Princes and the New Sacristy. 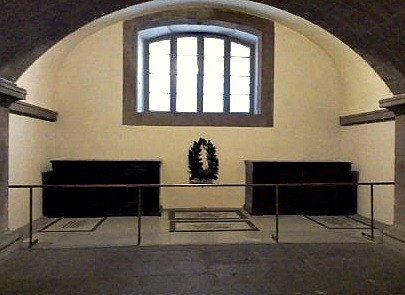 This dark and somewhat gloomy space (but I suppose that's fitting for a crypt...) is where the vast majority of the Medici family members are actually buried, including those who were meant to be entombed in the Chapel of the Princes. The crypt was built following a design by Bernardo Buontalenti. In the crypt you will see a large statue of an elegant lady sitting on a stately chair. This is Anna Maria Luisa de Medici, the last heir to the Medici family who died in 1743 leaving the immense artistic wealth of the House of the Medici to the city of Florence. In addition to the many tombs here, there are several glass cases enclosing valuable relics and reliquaries of saints. The crypt is also where you can find the gift shop and where you can rent the audio guide which tells about the three sections of the museum. There is not usually a long line for entry to the Medici Chapel except possibly June - August. 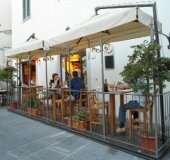 Closed on the 2nd and 4th Sunday and 1st, 3rd and 5th Monday of each month, New Year’s Day, May 1st and Christmas Day.